Let’s face it: We’re living on the edge. Fascism is on the rise; fuckboys are on the march. There’s plenty to be outraged about. As a writer, you can spend a lot of time trying to lecture your audience on the societal ills we face. Unfortunately, people generally don’t like to be hit over the head—even if they agree with your point. Enter satire. The satirist wields humor like a weapon, using it to expose stupidity and injustice. Satire is often political in nature because—let’s face it—there’s a lot of stupidity and injustice within politics. However, the satirist’s target need not be political in nature. Almost any societal folly or vice is ripe for ridicule. In this three-week workshop, students will study examples of satire from popular culture, from TV’s The Daily Show to Chuck Palahniuk’s Fight Club. Students will learn how humorists use satire to wage virtual war against a host of societal ills, from authoritarian politicians to seedy corporations. Whether you’re a novelist, screenwriter, poet, or social activist, New York Times bestselling humorist Andrew Shaffer will provide tips on utilizing satire to make your audience laugh and think. Students should bring a healthy sense of humor and a list of grievances with the modern world. Questions and interaction encouraged! Shaffer’s first novel, Fifty Shames of Earl Grey, was an international bestseller, prompting the Associated Press to call him “a pro at parodies.” His first satire, 2016’s The Day of the Donald: Trump Trumps America, imagined a world run by a reality TV game show host. (It has since been moved to the nonfiction shelves.) 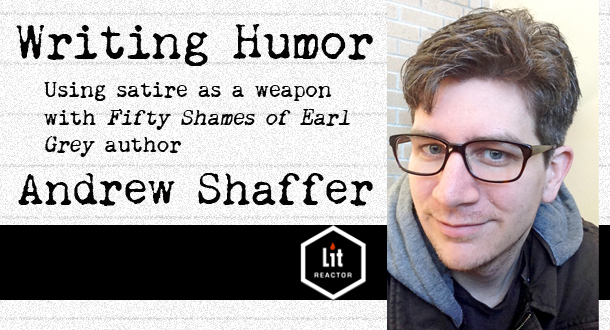 Shaffer teaches humor writing workshops and mentors at Lexington, Kentucky’s non-profit Carnegie Center for Literacy and Learning. An introduction to satire. Class will examine various examples, from movies (Bulworth, Heathers, Fight Club) to books (Animal Farm, American Psycho, Gulliver’s Travels). Learn the differences between “punching up” and “punching down,” and look at how this fundamental concept applies to your own satirical writing. What makes a good target for satire? If you want your satire to resonate with your intended audience, your subject must be familiar to them. On the flipside, a well-known target like the president of the United States will have been subjected to so many satirical barbs that it will be difficult to come up with a fresh take. Assignment: Over the course of a week, keep a running list of satirical “targets” that boil your blood, from politicians to human follies. Narrow the list down to 5-10 targets and bring to the next session. You know what satire is. You have a subject. Now it’s time to whip out the pen and get to work. This week, students will learn basic comedy techniques such as hyperbole (exaggeration), parody (imitation), and “working blue” (off-color jokes). Learn how stand-up comedians brainstorm and workshop material, and how this applies directly to writers working in other mediums. Assignment: Draft a short work of satire (500-1,000 words) based upon one of your targets from the first assignment. Satirists offend. In fact, if your satire doesn’t offend somebody, somewhere, then it doesn’t have the teeth to be called “satire.” As comedian Will Franken says, “A satirist is the opposite of a decent human being.” This week, you’ll learn about pushing boundaries. How far is too far? How soon is too soon? Both legal and ethical questions and situations will be discussed, with the caveat that the instructor is not providing legal advice. Who would accept legal advice from a guy who wrote a book called How to Survive a Sharknado, anyway? Assignment: Revise the short work of satire from Week Two, pushing the envelope as far as you can this time. Submit to the instructor for personalized feedback. "Every bit as amusing (and straight-faced) as the film franchise that spawned it." "Funny... Everyone should follow this guy [on Twitter]." "The literary equivalent of a good Saturday Night Live skit." "Laugh out loud... If you are looking for a funny book to share with friends, look no further." "This was a filthy, disgusting piece of perversion and I loved every word."